Interview: Mark Olsen and Will Scheffer, Producers Of 'Getting On' Set in the geriatric extended-care wing of a California hospital, Getting On is a different kind of workplace comedy. Mark V. Olsen and Will Scheffer adapted the show from a BBC series of the same name, and added new material largely inspired by experiences they had with their own mothers. When they set out to create the HBO series Getting On, Mark V. Olsen and Will Scheffer wanted to create a different kind of workplace comedy — one that celebrated the workplace and the employees in it. 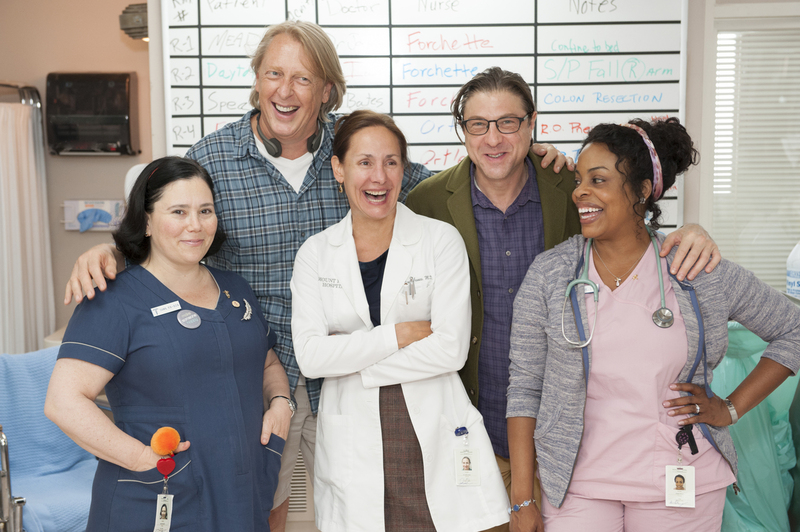 The show they came up with is set in a Southern California hospital, in a wing where the patients are elderly women who need extended care. It's told from the perspective of doctors and nurses tending to patients, many of whom are confused by dementia. Some are near death. The nurses are dealing with end-of-life issues, doctors and patients who don't appreciate what they do, and of course the messy realities of failing human bodies. Mark V. Olsen and Will Scheffer are a married writer-producer duo who also created the HBO series Big Love. Getting On is adapted from the BBC series of the same name, but has a lot of new material. Scheffer and Olsen talk with Fresh Air's Terry Gross about how much of that new content came from their experiences with their own mothers, who were both in extended-care facilities at the ends of their lives. Show creators Mark V. Olsen (back left) and Will Scheffer with their cast. In adapting Getting On, the men drew on their experiences with their own mothers, who were in extended-care facilities before they died. Will Scheffer: We used to say, "You can't avoid death and taxes" in this culture. But it's gotten to the point where you can't avoid death, taxes and caring for the elderly. And really, we're all dealing with this now. And we wanted to find a safe, funny, warm place where we could come as an audience and experience that. Olsen: Both Will and I have, in the course of the last five, 10 years, been devoted to the care of our mothers who are aging. And I think we've both had different takeaways from it, and different pieces that we've learned or that have become important to us. We kind of wanted to take a different approach to the workplace comedy. Instead of dramatizing or highlighting the ways in which the workplace dehumanizes us and makes us invisible and whatnot, we wanted to actually celebrate the workplace and celebrate the fact that in many instances, particularly amongst this group of caregivers, it gives value to a life. When my mother finally lost the ability to speak — because she was a very articulate woman, a very verbal woman, with a very storied past — when she lost that ability to speak and she was left with caretakers, it saddened me tremendously. It didn't matter who the caretaker was. Good caretaker, bad caretaker, didn't matter. They would never know who this woman was. They would never know her escapades in the U.S. Navy, or her adventures in the South Seas. They'd never know her interest in linguistics. They'd never know her rich, deep sense of humor. It hurts. It hurts on a deep, true level that we really didn't know what to do with it except put it in a show, in a way. I think what caring for our mothers really taught us — all the way up through the hospice experience — was that this part of life that so many people are afraid of, for good reason, it's kind of a privilege to be able to be there when you can. Scheffer: I think what caring for our mothers really taught us — all the way up through the hospice experience — was that this part of life that so many people are afraid of, for good reason, it's kind of a privilege to be able to be there when you can. So we would go over and see Mark's mom. He'd go over a lot and talk for hours, carrying on these one-sided conversations with her, and it always touched me to see how much energy it took to carry on a conversation when you're the only speaker. There was sort of a sense that, "Gosh, I was so afraid of this, I didn't want to do it; I didn't want to be here." But being here is starting to feel like a good thing, a good part of life — something that we avoid in this culture. That actually is a rich experience, albeit painful; it's actually so much a part of life. Laurie Metcalf (left) plays the role of Dr. Jenna James, with Alex Borstein as head nurse Dawn Forchette and Niecy Nash as Didi Ortley, the new nurse on the ward. Olsen: We decided to do an American adaptation because it was stunningly close to some ideas that we had been working up. Over the course of a couple of years, we were batting ideas back and forth between our commute to Big Love every morning about an adult woman and her two adult daughters, so the architecture of the three women working in the elder-care industry [was there], with much the same feel as the [BBC] show, showing the class differences and the comedic moments. Serendipitously, we were on a trip to London three years ago, and [British series star] Jo Brand's face was all over the Tube. And Googling her in the hotel room one night led us to YouTube clips of the show. I remember it was like 3 in the morning when I was watching them jet-lagged ... and shaking Will and waking him up and saying, "Oh, my God! You've got to watch this! It's exactly what we were doing! ... It's just spot on!" That led us down the road. Scheffer: We were able to talk to the British women who created it, and they were lovely. We used an awful lot of their material, of course, mixed with our own, to make this show. ... 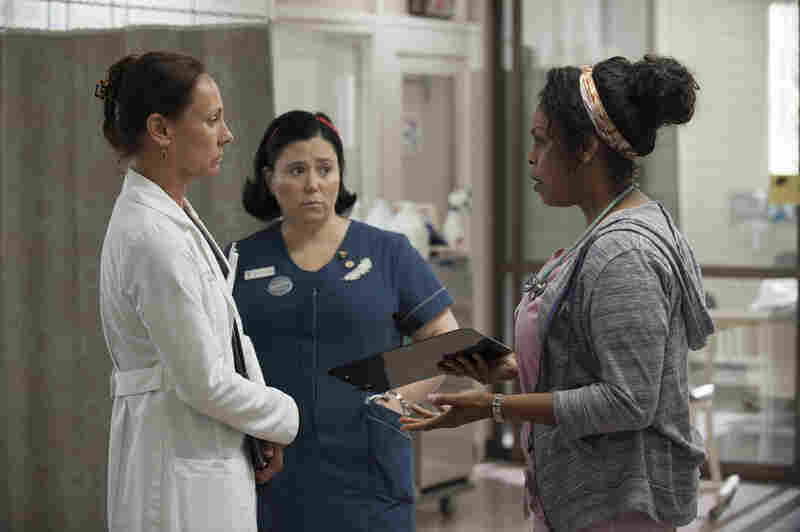 The whole documentary style of the show and the comedic treatment of these very difficult medical situations is based on their treatment of the material. Scheffer: When I had to take care of Mark [in the hospital], we weren't legally married. And I remember having to sort of fight my way sometimes into a room and say, "I am his domestic partner." It was tough and demeaning. Olsen: And God knows, when DOMA [the Defense of Marriage Act] fell and the federal government changed its stripes, it made just incredible differences in inheritance and the macabre, byzantine way we had to structure our estates and whatnot. Scheffer: As we thought about "getting on" as a gay married couple, it was always really scary to figure out what was going to happen with our lives. How we were going to take care of each other? How, if one of us died first, how it was going to affect the other? And I have to say that it was a tenuous situation still for us, as a not-recognized married couple in California, federally. This year we filed our first joint tax form together, and that was a huge symbolic step for us. This has been a huge experience being recognized, federally, as a married couple.